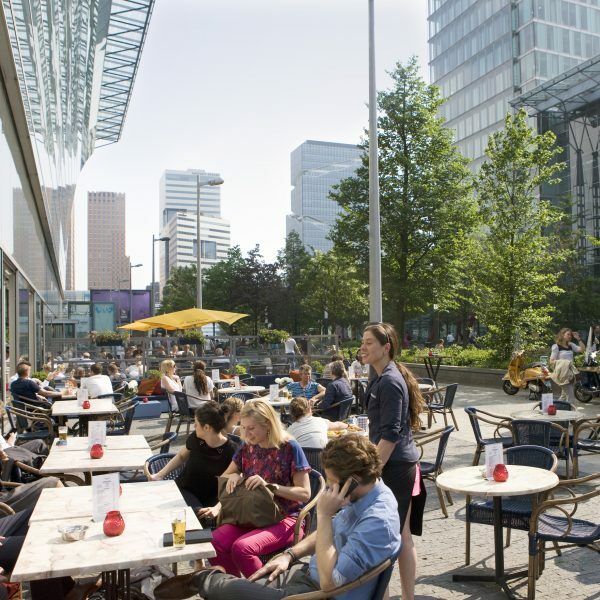 As places of interaction, cities need two features: infrastructure connections and meeting or gathering places. Historically, many cities were established on natural or manmade crossings such as rivers and roads, or grew from harbours. At these crossings, trading places with markets and inns developed into villages and later into cities. Streets and squares in these cities still bear names reminiscent of this past of trade and markets. Our cities today are still places of interaction in the global marketplace. Connecting and meeting face-to-face remains an important aspect of business development, innovation and social contact: firms need local buzz as well as global pipelines (Bathelt et al. 2004; Storper and Venables, 2004). Growing mobility demand however has changed many cities in nodes of infrastructure, forgetting the human scale and meeting places. By using the infrastructure constructions for the plinths of the city, we can provide new urban spaces and opportunities to interact and gather. Growing mobility have always required cities to adapt to new types of infrastructure. In 19th century Paris, baron Hausmann developed a system of new boulevards and avenues to improve connections. Also in other cities boulevards were developed, as well as new transport modes such as railways and tramlines: some on street level, some underground, and others elevated. Railway stations were the nodes in these networks and attracted businesses like hotels, bars and entertainment for the visitors. 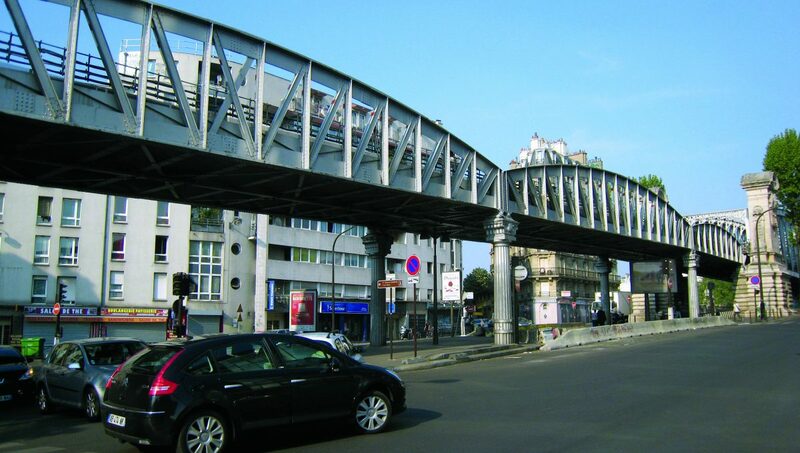 Elevated railways introduced new kinds of covered public spaces in the city; spaces to be used for markets, not intended as such but a by-product of the infrastructure. In the mid 20th century the development of new infrastructure for cars dominated most western cities. Unlike the grand boulevards in Paris with their contemporary street façades, these new highways often dissected cities, were disconnected from the urban fabric, and only linked at interchanges. No human scale and no street life are involved. In many cities citizens protested these transformations especially when neighbourhoods were at the mercy of bulldozers for the sake of more highways, a famous example being the opposition of Jane Jacobs against Robert Moses’ proposal for the Lower Manhattan Expressway. 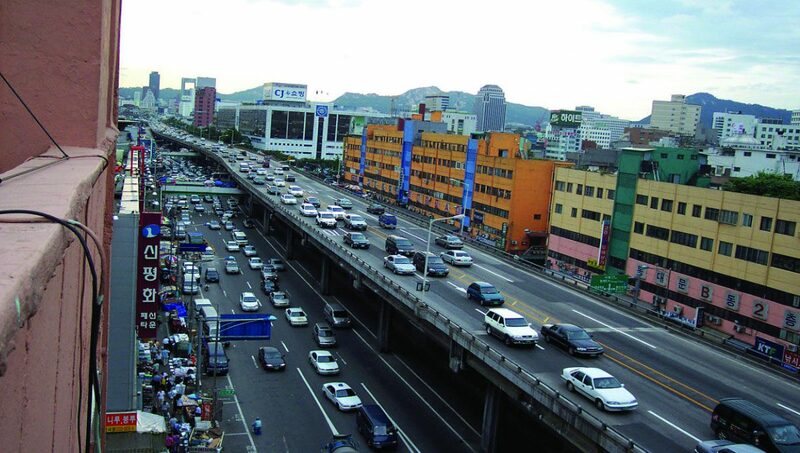 However we continue to see car-centred urban planning in many cities around the world, focusing only on the infrastructure and disregarding the relationship with city life, structure, and the human scale. Jane Jacobs’ activism (among others) in the 1970s shifted perceptions about the city and city life: cars should not be dominant, people should be. This thinking has led to “cover-up infrastructure”: the development and implementation of underground infrastructure with new functions and urban spaces on top. New local streets and parks on top of tunnels give new meaning and commercial development purposes for the surrounding buildings and plinths. In Paris, a park on Avenue du Président Wilson in SaintDenis covers the A1 highway. 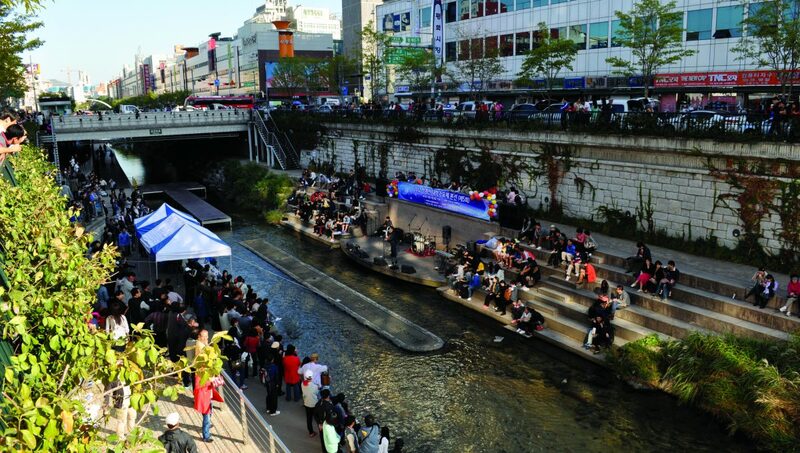 In Seoul, an inner-city elevated highway was demolished and replaced with a historic stream and Cheonggyecheon Park. Unfortunately, these redevelopments for removal or bringing underground of fixed infrastructures are expensive solutions. Since not many cities can afford these solutions, infrastructure that provide space underneath may be more interesting. 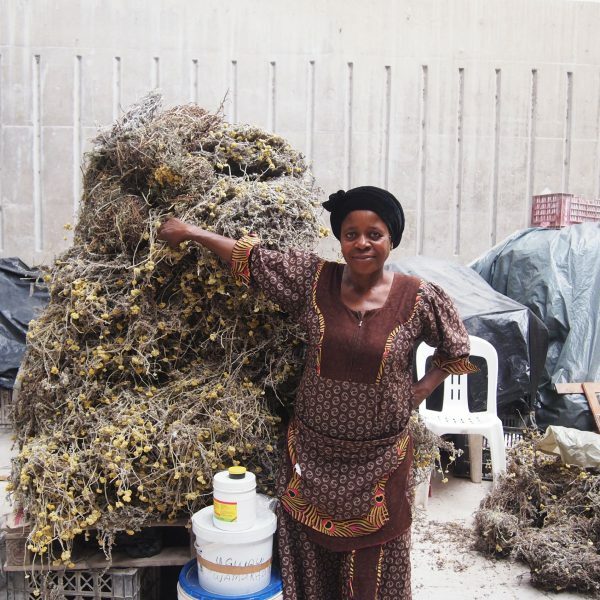 In many cities, markets belong outdoor despite disadvantages of the weather (rain or hot sun). 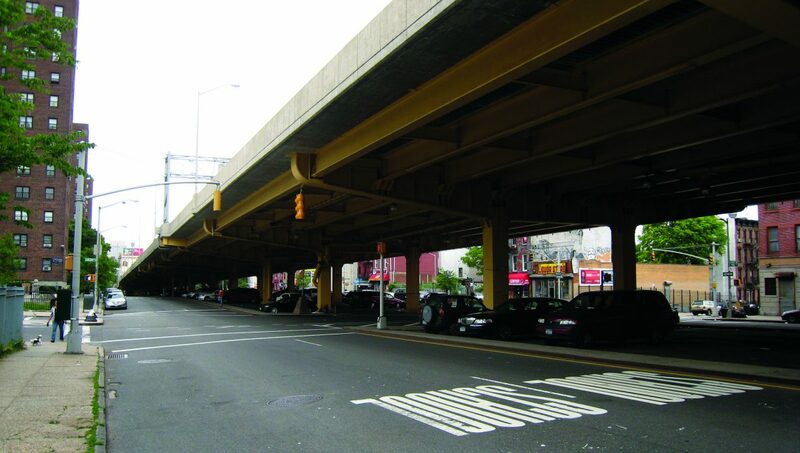 Infrastructure can provide dry and shadowed spaces, if markets are located under bridges and overpasses. 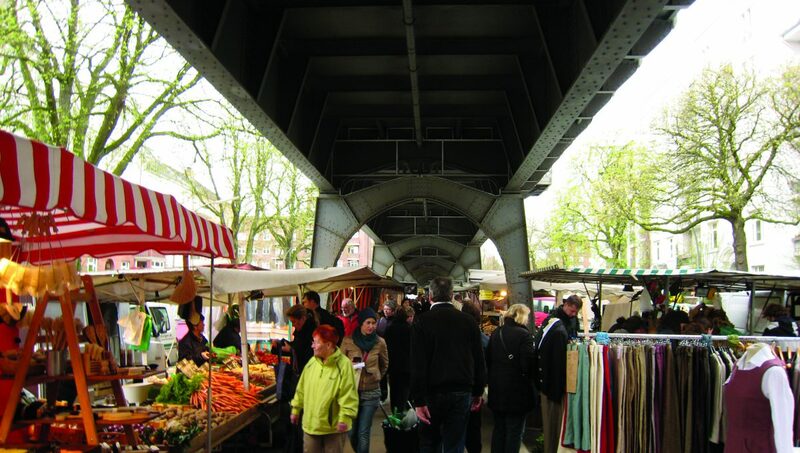 In Hamburg, Germany, the Isemarkt is a weekly market under the local U-bahn viaduct in the Isestraße. While the viaduct is from 1912, the market has been held since 1949 and with a length of 970 meters (0.6 mile) it is now Europe’s longest open-air market. In Sacramento, California, a parking lot underneath the eight lanes of Highway 50 transforms every Sunday into California’s largest farmers’ market. At this market, farmers and ranchers from the surroundings valleys connect and trade with the local chefs and home cooks. A third type of use is to develop the space underneath the infrastructure into a truly urban-built plinth with street façades and functions. These spaces can have commercial or cultural uses such as restaurants, galleries, or workshops, depending on the needs of the neighbourhood. These new plinths add activity and life to the street, making it a part of the city’s economic and social structure and creating a more pleasant and safe route along it. 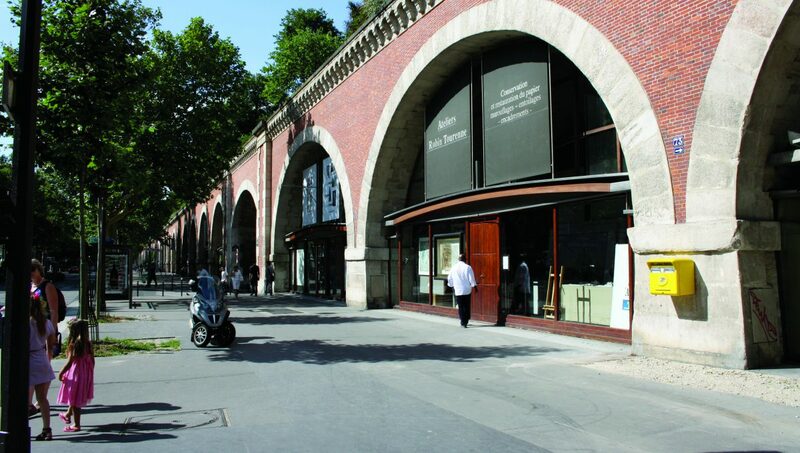 One of the best known examples is the Viaduc des Arts, underneath the arcades of the Vincennes railway line in Paris. In 1988, architect Patrick Berger’s plan was chosen for the conversion of the line into a strip of art galleries and cafés. The Promenade Plantée was created on top of the viaduct, a 4.7 km (2.9 miles) elevated linear park. Similar projects with new galleries and workshops were developed in Amsterdam (Onder de Bogen) and in Rotterdam (Hofbogen). These developments of infrastructural plinths enable space for artists, craftsmen and commerce, bringing life back to neighbourhoods that lacked vibrancy and cohesion due to the transection of the railway. H. Bathelt, A. Malmberg and P. Maskell (2004). Clusters and knowledge: local buzz, global pipelines and the process of knowledge creation. Progress in Human Geography, 28 (1), pp. 31-56. M. Storper and A.J. Venables (2004). Buzz: face-to-face contact and the urban economy. Journal of Economic Geography, 4 (4), pp. 351-370. Cities are places of connection and interaction: space for infrastructure and place are both needed. Instead of planning them back-to-back we can design for a cohabitation of infrastructure and people. 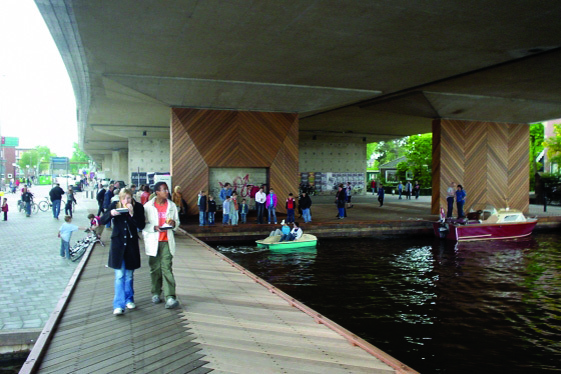 Infrastructure designed not only to connect the city and region, but also to connect on the street level, adding functions and meaning for the surrounding neighbourhoods. We can use infrastructure to develop commercial, leisure, and cultural places and activities for the city, and use spaces underneath infrastructure as places for people to meet and to expand public space and public life. Even when the infrastructure becomes derelict (e.g. old train viaducts), they still can provide valuable space underneath and on top.